I was running in the park yesterday (or hobbling as I call it) and I passed a set of identical twin boys playing in the park. Their parents had dressed them - you guessed it - identically. Cause why allow your children their own separate identities as long as they’re under your control. Sorry; too much sarcasm for a Monday morning? I am thinking it is now abundantly clear that this is always something that has 'disturbed' me. I shall happily give those that do this the benefit of the doubt and first look at this from the perspective of ease. You’re a parent of twins; you’re doubly exhausted (in ways I can’t imagine) and when you shop you just pick up two of everything and throw your children in the outfits without a second thought. Okay, I get that. Of course my jaded kneejerk response to this is, is it that difficult to throw a blue t-shirt on one kid and an orange one the other? So that of course begs the question, why? Why do parents with identical twins insist on dressing them alike when it would appear hard enough to differentiate yourself when your sibling has the exact same face you do! Perhaps it is for the sheer ‘awww how cute’ factor of having two kids wearing the same outfits. Then again, maybe it’s pure sadistic fun on the part of the parents to utterly confuse the public as to which child is which. 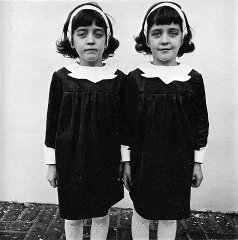 I always thought being an identical twin would be a pretty challenging feat in itself. Yes there are advantages – and don’t you know I would work every angle if I were a twin. You could actually be in two places at once; you could take each other’s exams; scope out perspective dates; do things for each other the other did not want to do. Yes, my ideas all steeped in mischievous behavior, but isn’t that the upside to having a person that looks exactly as you do? Oh come on, think of the fun to be had. The other thing that would be pretty cool is that you would finally see what you looked like in the flesh; yes, I realize we do have mirrors, but it’s altogether different than being out shopping and seeing yourself (in twin form) come towards you so that you can really see what you look like three dimensionally.